Replace your old water heater with a heat pump water heater. Reduce thermostat setting to 120 degrees. Have an electrician disconnect the power at the breaker panel before attempting any electrical work. Have an electrician or plumber assist you if you feel you are not qualified. Most energy-efficient dishwashers have a heating element to sanitize dishes which is more efficient and less costly. Install low-flow shower heads. Many newer models provide invigorating showers with less hot water. Add an extra blanket of insulation if the water heater is in an unheated location and is an older less-insulated model. Fix leaky hot water faucets or pipes. They can leak over 2000 gallons of water a year and waste the power used to heat it. Showers use less energy than baths. Do not leave the hot water running longer than necessary when using it. Vacuum coils on back or bottom once or twice a year to remove dust and debris. Set refrigerator temperature no colder than 37 degrees and freezer at 0 degrees Fahrenheit. Keep freezers and refrigerators filled to near capacity. If your unit is not frost-free defrost it regularly. When replacing older units consider ENERGY STAR® appliances and get a rebate. Preheat ovens only when needed. Meals that take more than an hour to cook can be started in a cold oven. Every time you open the oven door, you can lose 25% of the heat in it. "A watched pot never boils." Glass or ceramic cookware conducts heat more efficiently than most metals and you can finish cooking on lower heat. You may be able to reduce cooking temperature by 25 degrees. Microwaves can cut cooking energy by up to 40%--considerably less energy than conventional oven. Try to wash full loads most of the time. Use the energy-savings cycle whenever possible. Use the no-heat dry unless you are in a hurry. When replacing, consider an ENERGY STAR® model. Check the dryer vent to make sure it is not clogged with lint and is venting the moist air outside the home. Try to operate the dryer when it is full nearly to capacity but not overloaded. Use the lowest heat setting for the load type being dried. Clean the lint filter after each load. Remove clothes immediately at the end of the drying cycle to reduce the need for "fluffing" or "dewrinkling." Leaving for a few days? 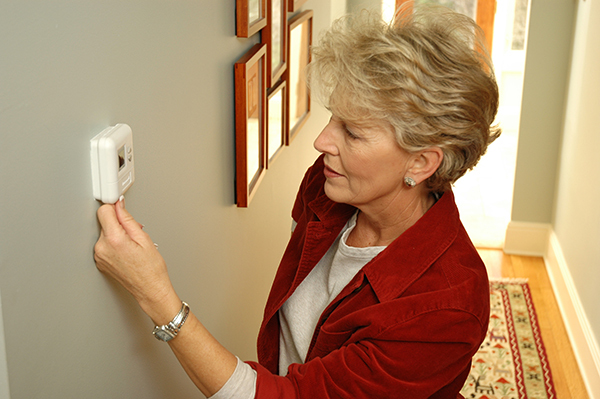 If gone during heating season lower your thermostat(s) to 50-55 degrees. If you are gone for more than three days turn off your electric water heater.